© All Rights Reserved Outi K.
For most visitors to Malaysia, Johor Bahru is just a stopover city. But this perception about the town is just not right. Johor Bahru of today is just different from yesteryears. It has reinvented itself and yet, it is traditional in its heart. It is the capital city of the state of Johor and most people use it as gateway to Singapore. Due to its proximity to Singapore, it unavoidably suffers from comparison with its neighbour. Clean-up initiatives like greening the city and covering the open sewers that until a few years ago ran through the centre of the city have made it a more pleasant place to live. However, there has been little effort in maintaining buildings and public facilities, and the city centre may seem run-down to some. Shopping and eating in the city can be a real adventure, with many shopping complexes and a wide variety of food establishments offering from street food to fine dining. There are also plenty of spas and resort hotels in the city, typically at much lower prices than the ones in Singapore. North - Its main centers are Taman Daya, Taman Mount Austin, Taman Desa Tebrau and Ulu Tiram, which can be accessed via the trunk road, Jalan Tebrau. There can be a relatively frequent peak hour jam along this road. The area has been a hive for construction activities with the latest AEON Tebrau and IKEA Tebrau locating in its vicinity. Royal Abu Bakar Museum is counted among the finest museums in South East Asia, it showcases the treasures of the royal family of Johor Bahru. The museum was founded in 1990 by the late Sultan Iskandar (1932–2010) in Istana Besar, or Grand Palace, built by Sultan Abu Bakar in 1866. Apart from an extensive art collection, the museum presents the ceremonial regalia, personal memorabilia, furniture, objects d'arts, and cultural artifacts associated with the royal family of Johor. 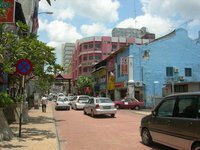 Shopping in Johor Bahru is around the city square of Dataran Bandaraya. If you wish to buy souvenirs or gifts, you should visit Pasar Malam, the local flea market. Grand Palace (Istana Besar), Jalan Belukar, 80000. 9AM-5PM (Saturday-Thursday). The palace consists of the Royal Abu Bakar Museum. The official entrance to the palace museum grounds is through a gateway facing the High Court building on Jalan Air Molek. You can also exit/enter the palace museum grounds by walking down/up the grassy slope to/from the main road - Jalan Tun Doktor Ismail. The museum is closed when there are official functions and ceremonies. Entry US$7/3 (payable in ringgit at a poor exchange rate) for foreign adults/children, RM5 for Malaysian and Singaporeans, and only RM1 for Malaysian children. Last ticket sale is at 16:00. Definitely Johor Bahru's top attraction, this is the opulent former residence (Istana Besar or Grand Palace) of the Sultan of Johor. It is still used for royal and state ceremonies and functions. 53-hectare garden (free admission). The adjoining Zaharah Botanical Garden lies about 300 m northwest of the palace museum complex centred about a roundabout. The palace complex was first completed in 1866 but has been extended and refurbished many times since. It was built in the neoclassical style by local artisans under the supervision of a European architect. The original furniture of the palace was made in England and ordered by Sultan Abu Bakar in 1866. The museum is housed in two of the three white buildings (all with blue-tile pitched roofs) in the complex and consists of 4 parts: the Dewan (in the west building); the Throne Room, the Treasure Rooms and the Hunting Room (in the central building). The east building is not open to the public. The scale of the palace is suitably grandiose. Photography inside the museum is forbidden. Johor Bahru City Square (Dataran Bandaraya Johor Bahru), Jalan Datuk, Sri Gelam, 80100. Johor Bahru City Square is a public square that was constructed in conjunction with Johor Bahru being granted city status on January 1994. A yellow coloured building with a gigantic, yellow clock tower built stands on the north edge of the square. The square is surrounded by two sports fields on the south side and three sports fields on the west side. Many outdoor events are held here. To get there from the city centre, take any of the very frequent buses (one-way fare RM1) that go to Bukit Indah/Kulai/Selesa Jaya from opposite City Square (starting point) at Jalan Wong Ah Fook or from the bus stop in front of the old railway station at Jalan Tun Abdul Razak. Free. Mahmoodiah Royal Mausoleum (Makam Diraja Mahmoodiah), Jl Mahmoodiah. This is a royal mausoleum of Johor state. It is a white colored building with two domes. The first sultan of Johor laid to rest here was Sultan Abu Bakar in 1895, as are the three sultans that reigned after him - Ibrahim, Ismail and Iskandar. Other persons interred here include: sultanahs (wives of the sultans) - Sultanah Fatimah, Sultanah Ungku Maimunah Ungku Abdul Aziz, Sultanah Rogaiyah, Sultanah Tun Aminah; other royal family members; notable politicians like Dato' Jaafar Muhammad, Dato' Onn Jaafar, Tan Sri Othman Saat and Dato' Muhamad Salleh bin Perang. The mausoleum is not open to the public. Arulmigu Sri Rajakaliamman Glass Temple, No. 22, Susur 1, Jalan Tebrau (less than 50 m west of Tebrau Highway and 400 m north of Tropical Inn/Landmark Shopping Centre and beside the railway track). Inaugurated in 1996 and touted as "The First Glass Temple in the World". The inner surface of the walls and the columns inside the temple are clad with imported glass, hence the name. The floor is paved with granite. There's a canteen at the back of the temple building and sells only Indian vegetarian food. Thousands of tourists and pilgrims coming here everyday. There are food and drink stalls lining both sides of the driveway in the front of the temple. Temple prayer hours 07:30-12:00 daily; Temple closure Tu-Su 12:00-13:00 & M 12:00-19:00; Temple visiting hours daily except Mon (closed to visitors) 13:00-18:00. Chitra Pournami Paal Kudam Festival held every Wed and Glass Chariot Procession held every Thurs at the temple. RM10/5 for adults/children (5-12 years old), still photography/video fee RM3/5, leaving shoes with the guardian RM0.50. Johor Bahru Old Chinese Temple (柔佛古廟), Jalan Trus. 7:30AM-5:30PM. It is a Chinese temple believed to be built in 1870 by a group of Chinese community leaders led by Tan Hiok Nee, a famous, local Teochew businessman. This is where five different Chinese dialect groups - Cantonese, Hainanese, Hakka, Hokkien and Teochew - worshipped their respective deities and their effigies are all found inside the prayer hall. The Goddess of Mercy and the Weather God are also worshipped here; their effigies are found outside the prayer hall. The prayer hall is straight ahead as you enter the wooden gate entrance from Jalan Trus. There is a small museum behind the prayer hall which have illustrated descriptions of the five deities and the history of the temple, as well as giant photos showing the Parade of Deities (see below). Photography is forbidden in the museum and captions are mostly in Chinese only. The temple organizes an annual 4-day Chingay parade known as the Parade of Deities. The climax of the parade occurs on the night of the 3rd day when the deities are paraded around the city centre. Free. Mawar Gallery (Galeri Mawar; Mawar is the Malay acronym for Majlis Wanita Johor), No. 888, Jalan Sungai Chat, 80100 (50 m west of the Thistle Hotel on the same side of the road), ☎ +6072214100. M-F 10:00-16:00. Complex consists of several buildings, among them a handicrafts workshop (closed to the public) and 'Rumah Mawar' (also known as 'Galeri Mawar'). The latter is housed in a pretty 2-storey white building. It has photos of members (especially female) of the Johor royal family and various famous women of Johor. There are also displays of clothes worn by Sultanah Zanariah on the first level and mannequins wearing wedding clothes and traditional Malay clothes on the second level. The admission of RM5 includes a mandatory guided tour of the 'Rumah Mawar'. You have to get one of the staff from the administration building to open the door to the 'Rumah Mawar'. He or she will act as a guide. Photography is forbidden except for the mannequin display on the second level. There is a small canteen selling Malay food at the entrance to the complex. To get there from the city centre, take any of the very frequent buses (one-way fare RM1) that go to Bukit Indah/Kulai/Selesa Jaya from opposite City Square (starting point) at Jl Wong Ah Fook or from the bus stop in front of the old railway station at Jalan Tun Abdul Razak. Alight at the bus stop in front of the red-colored Sultanah Aminah Hospital on Jalan Abu Bakar. It is about 5 min walk from here. Chinese New Year (05 Feb 2019 - 19 Feb 2019) - Chinese make up about a quarter of the total population and in honour of the Chinese New Year, Malaysia has declared the first two days as public holidays. In the Gregorian calendar, Chinese New Year falls on different dates each year, a date between 21 January and 20 February. On 5 February 2019, the year of the Pig commences. The city has an equatorial climate with consistent temperatures, a considerable amount of rain, and high humidity throughout the course of the year. Temperatures range from 25.5 °C to 27.8 °C with an annual rainfall of around 2,000 mm, mostly from November until February. Although the climate is relatively uniform, it can change through the monsoon seasons with variation of wind speeds and direction, cloudiness, and wet and dry seasons throughout the year. There are two monsoon periods every year, the first one happens between December and February, and is known as northeast monsoon. It is characterised by heavy rains and winds from the northeast. The second one is the south-west Monsoon, characterised by relative dryness with winds driven from the south and south-west. It occurs between June and August. There are two inter-Monsoon periods from March to May and from September to November, which are relatively calm with less rain and weaker winds. Daily flights connect Senai Airport to various Malaysia cities like Kuala Lumpur, Kuching, Kuantan and Kuala Terengganu. It also has some international flights to other Asian cities. Johor Bahru houses the JB Sentral and Kempas Baru railway stations. Most visitors to JB arrive from Singapore via the 2 Causeway linking Malaysia and Singapore is a very popular and thus often congested entry point connecting directly into the heart of JB. While congestion isn't as bad as it once was, the Causeway is still jam-packed on Friday evenings (towards Malaysia) and Sunday evenings (towards Singapore). The Causeway can be crossed by bus, train, taxi or car. Entering Singapore with a foreign-registered car is more complicated and expensive. Rental agencies will frequently prohibit their cars crossing the border or charge extra in both directions. The main bus station can be a bit hectic and scammers tend to wait outside offering to buy tickets for you. Just walk in and buy a ticket from the different booths for the different bus companies. This is a major bus station and it connects with most major towns in the area. Most places north of Kuala Lumpur will connect and stop in Kuala Lumpur for a few hours. In the bus station itself are several small grocery stores and some fast food restaurants. If going to Singapore it is possible to use a different bus station. From the Johore Bahru CIQ Border complex you can take Transtar TS1 to Singapore airport (and other places in Singapore, with some airlines, Scoot for instance, free If you show your bording pass) every 2 hours and taking about 2 hours. If the Transtar bus is not included in your airticket, from the Larkin bus terminal take SBS Transit bus 170 for 1,80 Ringit, last stop is Queen street terminal not far from Bugis metro station. The 6 ZON Ferry Terminal, ☎ +6072211677 is located in the east wing of "The ZON" duty free complex. Ferries go to Batam and Bintan in the Riau Islands of Indonesia. The east wing of the complex is mostly three-storey and also comprises a big KTV club and several bars. To reach the ferry terminal's arrival/departure halls on the second level, you can go to the second level of the ZON shopping and hotel complex building, walk past the Restoran Hameed's (which is on your right) and then follow the signs to the halls. Alternatively, you can go right to the ground level of the east end of the main building (comprising the hotel, the shopping mall and the department store) of the complex. There, you will see a ticket counter beside a minimart. You can go up to the arrival/departure hall using the elevator or the staircase. There is a money changer and a small restaurant in the ferry terminal. Another ticket counter is located right inside the terminal's arrival/departure hall. There are many pusat penjaja or hawker centres across Johor Bahru. Hawker centres are basically a collection of pushcart, van or fixed stall vendors selling food or drinks in one particular area. Food and drinks are sold cheaply in these areas. We have a comprehensive list of accommodation in Johor Bahru searchable right here on Travellerspoint. You can use our map to quickly compare budget, mid-range or top of the range accommodation in Johor Bahru and areas nearby. This is version 23. Last edited at 14:35 on Oct 30, 18 by Utrecht. 18 articles link to this page.